We weren’t planning on moving house last year, but we started looking to get our bearings in preparation. We wanted to work out what was most important to us, get an idea of what we could get for our money and get a discussion going about location too. Jared would laugh at my comments after a viewing: “Didn’t you feel like the landing was a rabbit hole?”, “Didn’t the lounge make you feel stressed out?”, “Wasn’t the floor way too shiny?”, “Did you notice how amazing the eucalyptus tree was?”. Unsurprisingly, his answer was ‘no’ to all of my questions. We started looking about a year before we planned to move, but the inevitable happened – we ended up seeing a house that we loved. The house we eventually moved to was the fifth house that we looked at, and like our previous home, I said to Jared: “I want to buy that house”, as soon as I stepped out of it. I just knew – I could imagine the five of us living in the rooms, and playing in the garden. I was more sold on the garden, and Jared was more sold on the house. The layout of the house was quite strange in places, and we knew we wanted to make it flow more freely. It also didn’t have a family bathroom. In its place was an empty room with a towel rail, and from the onset we planned to do this first. For months we had to stop ourselves planning the renovations, as we didn’t want to get our hopes up. 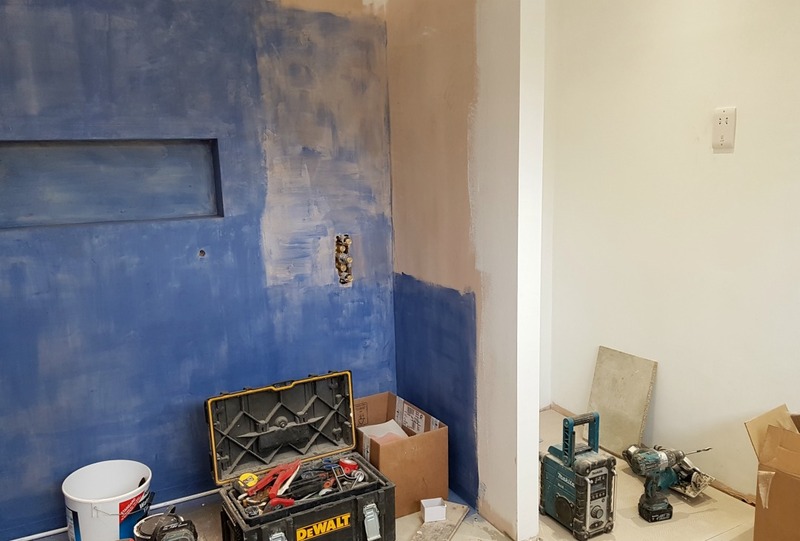 A plumber we contacted suggested that we go to a local bathroom showroom to get some help planning our bathroom, and it was such a valuable process. We thought we knew what we wanted, but he questioned everything single one of our choices – “What do you like about that toilet?”, “Why are you so adamant about having a wet room?”, “Why do you want two towel rails?”, “Do you want your extractor fan to be efficient, or is it just for show?”…all whilst the boys enjoyed playing in the showers and bidets. 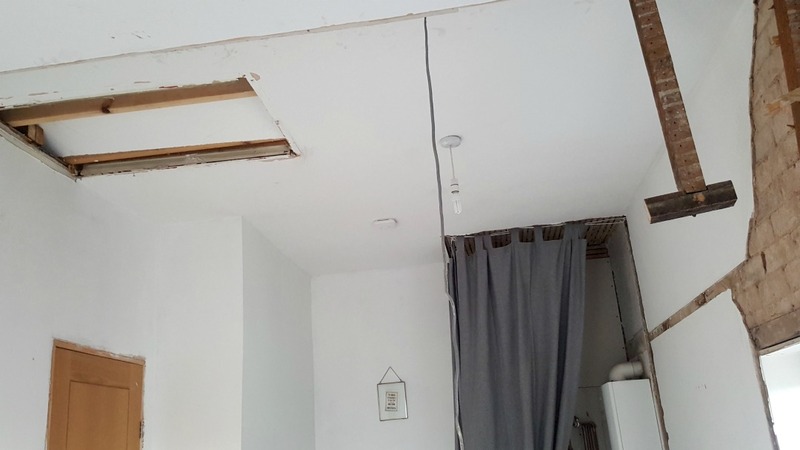 Before going to the showroom, we fully planned to use them to supply and install our bathroom, but it soon became clear that it wouldn’t be financially feasible. We did end up buying a few items through them, but we sourced the same (or similar) online or through eBay, and in the process saved ourselves thousands of pounds. For example, the same bath was over £700 through the showroom, but I found a brand new one selling on ebay for £265. The price differences have been staggering and it certainly pays to shop around. 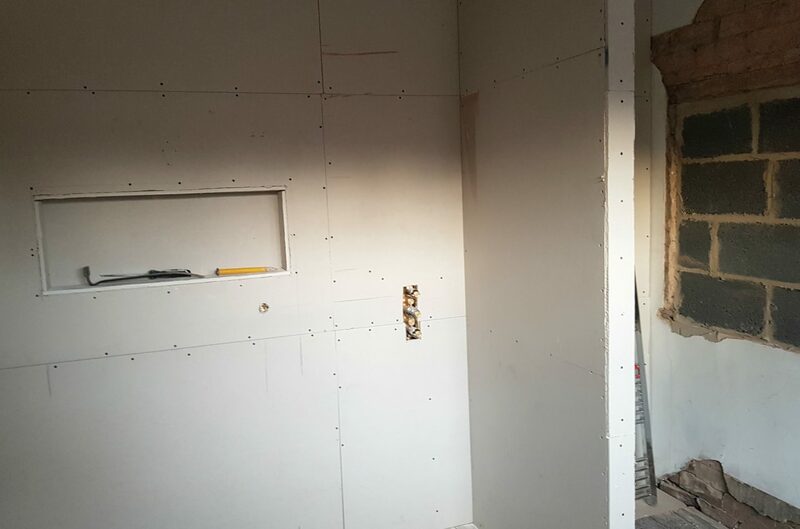 Firstly, we (Jared rather) knocked down an interior stud wall to make the bathroom a little bigger, then we had two windows bricked up, and created a new window above the bath. 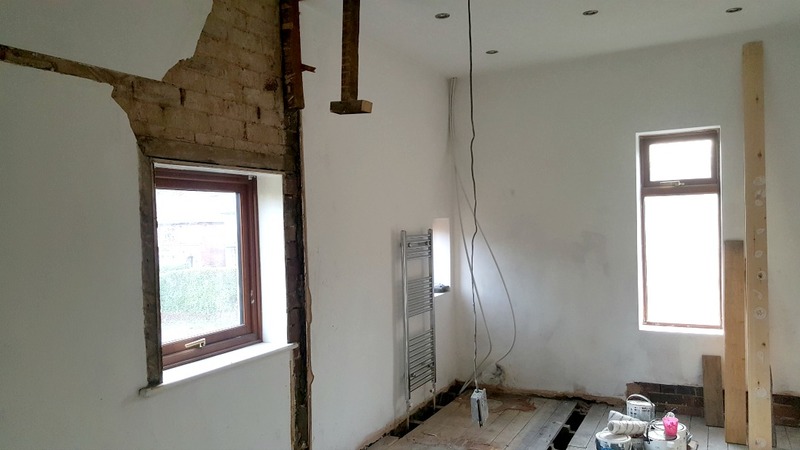 The stud wall was rebuilt, the ceiling boarded and the whole room plastered – all before any proper installation could begin. Our bathroom is mostly done, but the bath still isn’t fitted, along with a few other essential jobs. 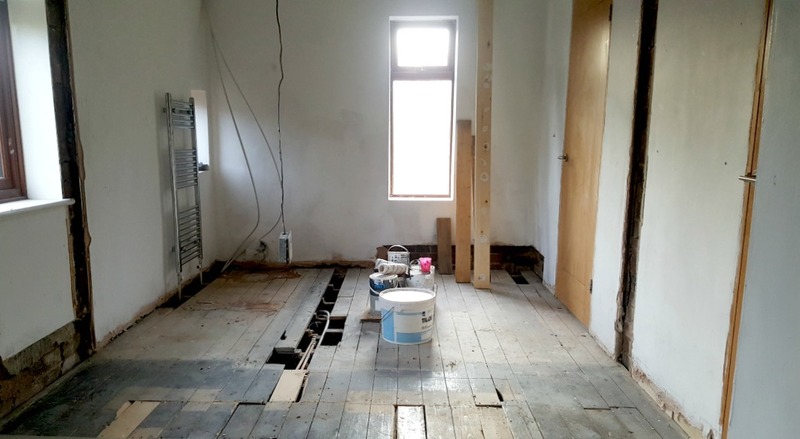 Our plumber has had to move onto other projects, and nips back when he gets the chance, which is frustrating and less often than we’d like. The other end of the room with the boiler, is now a walk in wardrobe connected to Jared and I’s room. We created a new opening and removed the internal door. We’ve been in the midst of renovations for about 4 months now, and it can be easy to forget how far we have come, because there is so much left to do. 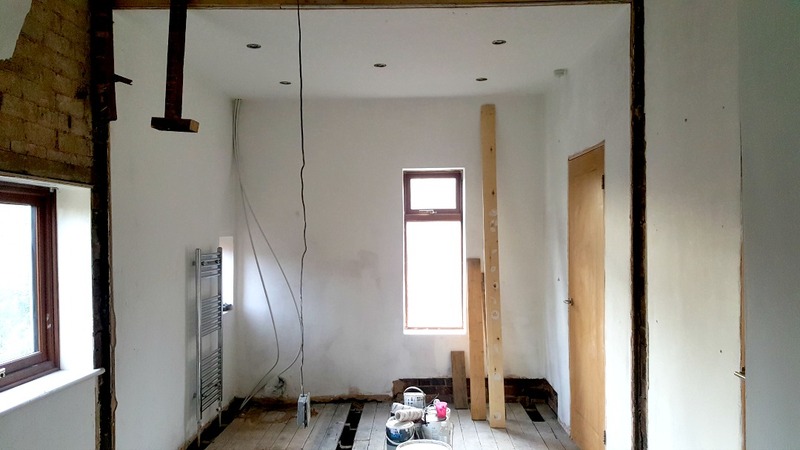 Current major projects include our bedroom, installing a downstairs toilet and the lounge. 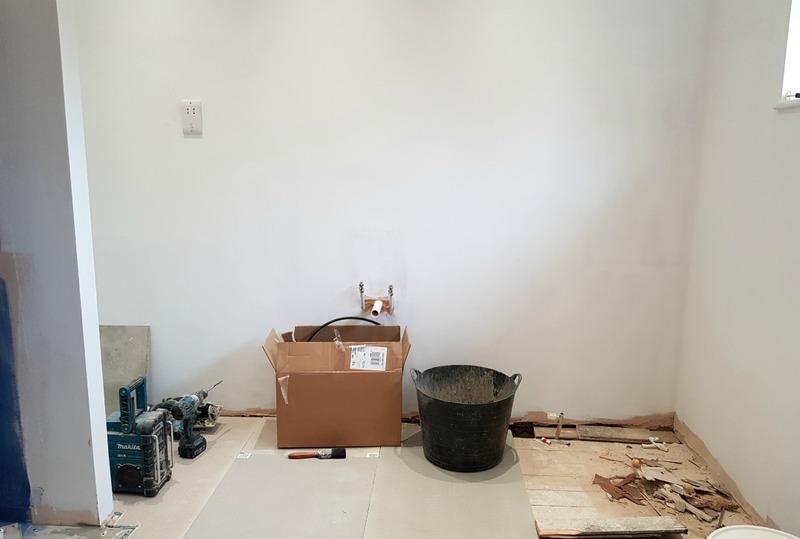 Progress is slowing down, but thankfully there is motivation to get it done before our new baby arrives, and I’m excited to show the full bathroom renovation once it is complete.